Families from our area- Mt Airy, Surry County, King, Galax Va, Elkin, and Winston-Salem know the importance of space and safety on the family road trip! 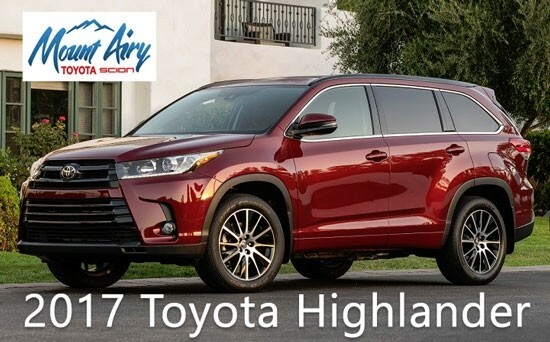 Mount Airy Toyota is excited to introduce the 2017 Toyota Highlander- coming soon to Mount Airy! A family mainstay, the 2017 Toyota Highlander has improved safety features and a bold, new design. This celebrated family vehicle is the perfect ride for you and your family, especially for long trips. The look to the new 2017 Toyota Highlander is deceiving: the exterior’s rugged, truck-like appearance shows off a little muscle and gives the idea this machine can drive through just about any terrain, which it can. But inside, it’s an entirely different feel. Thick acoustic glass muffles outside sounds, while extra cushion and insulation on the floor damps out suspension chatter. Throughout the inside there are trays and cubbies perfectly laid out to store and hold. The front dash is covered with soft-touch materials and attractive trim. And with 192.5 inches of length to the 2017 Highlander, there is room for everyone in the family to stretch and play. Seasoned crossover SUV drivers are sure to notice how well the 2017 Toyota Highlander is built. Often, crossovers can seem as though they’ve had corners cut and cheap materials used. But not the all-new Highlander. Take the seats, for instance. Each is tightly fastened to the vehicle’s frame, and each is made with quality spring and foam to create extra comfort that lasts. This is true luxury. The most important aspect to family road trips is safety. And Toyota kept this in mind when creating the 2017 Highlander. The Insurance Institute for Highway Safety (IIHS) gave last year’s model top safety ratings, which means this year’s will be even better. What makes the new Highlander so safe? The Toyota Safety Sense P suite. This innovative safety suite comes with forward collision warning with pedestrian detection; lane departure warning with lane departure prevention; automatic high beams; and, adaptive cruise control. The 2017 Toyota Highlander is safe, tough, fun, and ready to take you and your family on the next road trip. 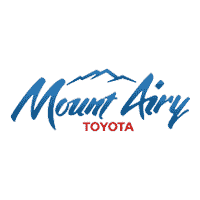 Stop in to Mount Airy Toyota today and test drive the all-new Highlander.